India can raise its renewable energy use to meet a quarter of the country's total final energy demand by 2030, according to the findings of a report presented today by the International Renewable Energy Agency (IRENA). Renewable energy prospects for India, a study from IRENA’s REmap programme, outlines action areas that can unlock India’s vast renewable energy potential, ensure clean and sustainable energy for generations to come, and enable the country to fulfill its pledges under the Paris Climate Agreement. Renewable energy prospects for India describes how solar energy will play a vital role representing the second largest source of renewable energy use with 16 per cent, followed by wind at 14 per cent, and hydropower at 7 per cent of the country’s total final renewable energy use by 2030. Biofuels — which can be used across the end demand spectrum, such as for transport, electricity generation and heating — would account for 62 per cent. The country could potentially increase its share of renewable power generation to over one-third by 2030. Increasing renewable energy deployment could save the economy twelve times more than its costs by the year 2030, creating jobs, reducing carbon dioxide emissions, and ensuring cleaner air and water, with savings on health-related costs. Furthermore, the renewable energy technologies identified in the report would lower the demand for coal and oil products between 17 per cent and 23 per cent by 2030, compared to a business as usual scenario. Meeting India’s electricity demand, which has grown by 10 per cent a year over the past decade, and attaining the country's economic growth targets will require significant investments in power-generation capacity and related infrastructure, and in transport, buildings and industry sectors, creating important opportunities for renewable energy deployment. IRENA’s report shows that investments in renewable energy capacity must more than double to make the most of India’s potential. Mobilising affordable financing and adapting new business models will be essential to achieve this. India will also need to accelerate the transformation of its power system to integrate higher shares of renewables by strengthening transmission grids, reducing grid losses, and in general improving the resilience of the power system by investing in more flexible system that values demand-response, interconnectors and storage, as well as greater transport and power-sector synergies. India’s population and economic growth, combined with accelerating urbanisation, is expected to increase the number of people living in cities and towns from approximately 435 million in 2015 to 600 million by 2030. In addition, estimates suggest that 80 million households — roughly 300 million people — have limited or no access to electricity. Renewables can improve energy access for poor communities and bolster energy security through diversified, and largely indigenous, sources of supply. 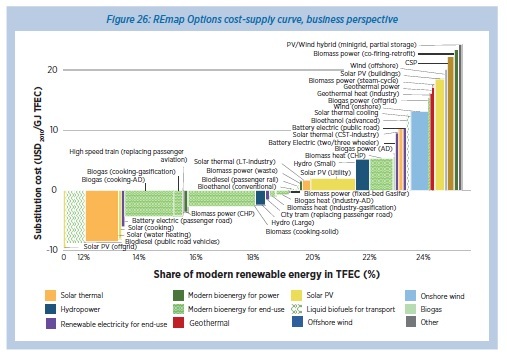 Renewable energy prospects: India REmap analysis is part of IRENA’s renewable energy roadmap programme, REmap, which determines the potential for countries, regions and the world to scale up renewables to ensure an affordable and sustainable energy future. The roadmap focuses on renewable power technologies and technology options in heating, cooling and transport. The India study is the latest in the series of country-level REmap analyses, which includes countries such as China, Germany, Indonesia, Mexico, Russia and the United States. There is only a marginal difference between solid fuel (firewood, charcoal) and modern fuel prices, with solid fuels being slightly more expensive. 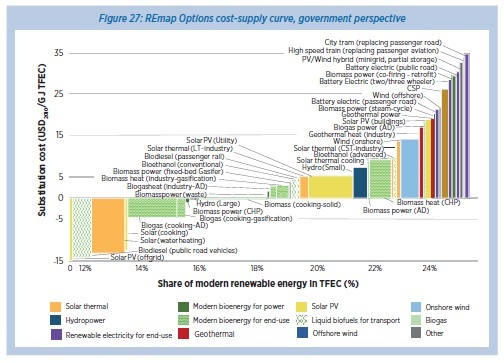 However, the cost savings are significant when the benefits of modern fuels are included (Dalberg, 2013). Biogas cookstoves are the most cost-competitive of all modern and traditional uses of fuels, with levelised costs for household and community-scale ones between 600-900 INR/GJ according to the CEEW (2015b). Firewood and LPG-based cookstoves generate heat slightly more expensively, at between 1 000-1 150 INR/GJ. Electric and induction stoves are more expensive still, with costs in the range of 1 550-1 650 INR/GJ. The National Solar Mission follows a phased approach that allows the government to modify guidelines and policies based on the experiences gained and lessons learnt in earlier phases. It has, thus far, successfully driven investment, taking India from a cumulative installed capacity of grid connected solar photovoltaic of nearly 10 MW in early 2010 to more than 2 500 MW by May 2014. During its first phase (2010-2013), more than 500 bidders competed for 63 projects allocated during two reverse auctions, driving prices to record lows. New solar energy investments in India increased to more than USD 2.5 billion in 2011. Phase 1 activities focused largely on achieving 1 000 MW of solar energy through an equal split between solar thermal and solar PV project technology. Competitive bids for the National Solar Mission projects have rapidly driven down tariffs. Phase 1 bids revealed prices as low as INR 7.49 (USD 0.15) per kilowatt-hour for PV projects making it competitive with diesel-fired captive electricity generation. Phase 2 of the National Solar Mission has set tariffs even lower, to stand at INR 5.45/kWh (USD 0.09/kWh) with viability gap funding, and INR 4.75/kWh (USD 0.08/kWh) with accelerated depreciation. Bids in 2015 and early 2016 all came in at around INR 4.2-5.0/kWh (USD 0.06-0.07/kWh) indicating that prices are at the lower range of the Mission’s target (Gambhir, 2016). The economic cost of outdoor air pollution health impacts has reached 3% of India’s GDP (World Bank, 2013b) and the estimated number of deaths from ambient air pollution (related to PM and ozone) reached 700 000 in 2010, up from 692 000 in 2005. The Global Burden Disease report has estimated that there are 620 000 premature deaths in India from air pollution-related diseases each year (Down to Earth, 2013). The Years of Life Lost (YLLs) from air pollution reached 18 million in 2010, while the DALYs reached 19 million (OECD, 2014). DALYs from indoor air pollution from biomass combustion stand at 5.5 million Coal used in power generation is alone estimated to shorten life expectancy in India by 2.5 years on average, according to a study that modelled its effects (Burt, Oris and Buchanan, 2013). Changing climate trends and air pollutants also hit agricultural yields. According to Burney and Ramanathan (2013), they had reduced yields by 36% by 2010, and by as much as 50% in densely-populated areas. Fossil-fuel based heat and power and transport results in outdoor and indoor air pollution. Emissions of fine particulates are some five times higher than the recommended threshold. Domestic sources and waste burning contribute 10-20% of total urban air pollution (Dalberg, 2013). Traffic growth is the main driver of deteriorating air quality (OECD, 2014). India has been adopting Euro vehicle classes quite ambitiously – Euro 4 had been adopted in 13 major cities by 2009 (UNEP Risoe, 2013). Half of the 180 cities monitored in 2010, and 60% of their population, are exposed to critical levels of PM10 emissions. Air pollution is increasing in large and small cities alike, thanks to both transport and other emission sources like coal combustion for power generation and polluting industries such as ceramics next to densely populated areas. One reason that emissions are rising so fast is that rather old emission standards are still in force in India (New York Times, 2012), though new standards are coming into effect. Varying climatic and geographic conditions over India’s large territory mean that the economic costs of health impacts vary from place to place. New Delhi, for example, has an air pollution problem when diesel heaters start operating, making it one of the world’s most polluted cities in winter. A huge cloud of pollution cloud stands in front of the Himalayas, whereas the effects of coastal coal plants is rather limited since wind disperses their emissions. Burning biomass is a prime source of both indoor and outdoor pollution. India, concludes a study by Yale and Columbia universities that assessed 132 countries, has the worst air pollution in the entire world. Its high PM2.5 levels are about five times above the threshold considered unsafe for human beings. PM causes acute respiratory diseases – the most common causes of deaths in children under five in India (NY Times, 2012) – and is linked to cancer. The benefits of cleaning up coal power plants are 25 times higher than the costs (Burt, Oris and Buchanan, 2013). Markandya et al. (2009) found much higher benefits from mitigating carbon dioxide emissions from the power sector in India (USD 46-49/t CO2) than for the EU and China (in the order of 2-7 USD/t CO2), but this includes savings from a switch to renewables, which also offer significant benefits. A shift from burning coal to generate electricity will reduce both greenhouse gas emissions and fineparticulate air pollution. Several studies have estimated the probable health benefits. Roughly 90 000 premature deaths could be averted in India every year (Haines, et al., 2012). India has some of the world’s most competitive levelised costs of electricity (LCOE), even for wind, where the quality of the local resource is lower than in other regions. Financing costs, however, are somewhat higher than in neighbouring countries like China, and this has an impact on the LCOE. 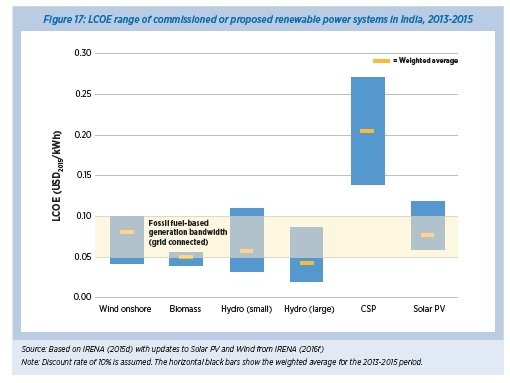 Figure 17 gives an overview of ranges and weighted averages for renewable power technologies commissioned or proposed between 2013 and 2015. Hydropower is still the lowest-cost renewable power generation option, with weighted average costs of between USD 0.04/kWh and USD 0.05/kWh for small- and large-scale projects, respectively. Large-scale wind projects have average costs of around USD 0.08/kWh, with a range between USD 0.045/kWh and USD 0.11/kWh, with small-scale. The weighted average LCOE of utility-scale solar PV fell to around USD 0.06/kWh in early 2016 and in early 2017 some PV auction have broken the USD 0.05/kWh mark, but there was still a wide range of costs, and projects with an LCOE of twice this average that are still being built. The total package of REmap Options identified would result in an incremental cost of substitution of USD 2.3 per GJ for consumers and result in additional costs of USD 3.8/GJ for society, making a total of USD 17 billion per year in additional costs. These exclude savings from the benefits of renewable energy from improved human health and reduced CO2 emissions. These USD 17 billion total system costs would be outweighed by estimated savings from the effects of reducing air pollution, which amount to USD 46-161/yr, and from a reduction of 750 Mt of CO2 emissions per year by 2030, saving USD 13-63/yr. Most of the savings related to air pollution are associated with the effects of traditional uses of biomass in the residential sector. The REmap Options would also have positive macroeconomic benefits for India across the board, resulting in higher GDP and significant net employment effects. Observed from a business perspective, the average cost of substitution with Remap Options is USD 2.3/GJ of final energy. Viewed from the perspective of governments, this cost increases to USD 3.8/GJ of final energy. To put them in perspective, they represent around USD 8-11/MWh in additional cost if the entire portfolio of technologies is deployed. The costs would be borne across the entire energy system, by all energy services that are impacted by the renewable energy technologies, including power generation, heating, cooking and transport. Substitution costs differ greatly by sector. They are cost competitive in the building sector from both a business and government perspective, with a substitution cost of USD -5/GJ to USD-7/GJ, driven largely by the economics of replacing traditional uses of biomass with modern renewable energy. The transport sector has a very low incremental cost of USD 1.5/GJ from the business perspective, due to the effect of taxation on transport fuels, but increases to USD 6/GJ from the government perspective when these taxes are removed. The industrial sector has a narrow range of costs, from USD 2.5-3.0/GJ from the business and government perspectives, respectively, as a result of relatively low taxation on fuels used in industry. The power sector has the highest average cost of substitution at USD 6/GJ from the business perspective and USD 8/GJ from the government perspective, largely due to the substitution of coal. However, all costs presented here exclude any external cost reductions arising from the REmap Options. International Renewable Energy Agency (IRENA) http://www.irena.org, mandated to be the global hub for renewable energy cooperation and information exchange by 150 Members (149 States and the European Union). 27 additional countries are in the accession process and actively engaged. IRENA promotes the widespread adoption and sustainable use of all forms of renewable energy, in the pursuit of sustainable development, energy access, energy security and low-carbon economic growth and prosperity.